Hey Project Manager, are you a more of a Jedi or a Stormtrooper? This past week I was having a conversation with a colleague on what they should look for in a project manager. Out of curiosity, I did some digging across various organization’s standards at what they describe as the “role of a project manager”, here is what I found. First I looked in PMI’s PMBOK Guide Version 5 where it states on page 17 “In general, project managers have the responsibility to satisfy the needs: task needs, team needs, and individual needs.” It goes on to state that “The project manager’s role, therefore, becomes increasingly strategic. However, understanding and applying the knowledge, tools, and techniques that are recognized as good practice are not sufficient for effective project management.” I have read this several times and… well… huh? Let’s replace project manager with that with Airline Pilot. They have to satisfy needs, task needs, team needs, and individual needs also. “A pilot’s s role, therefore, becomes increasingly strategic. However, understanding and applying the knowledge, tools, and techniques that are recognized as good practice are not sufficient for effective piloting of aircraft.” Do you see my point? Next, I looked at what Axelos lists for PRINCE2. They state that the Project Manager is the single focus for day-to-day management of a project. This person has the authority to run the project on behalf of the Project Board within the constraints laid down by the Project Board. Can we say “stating the obvious”? You could ask a third grader what they think a project manager does and they would say “manages projects”. It seems that the majority of the definitions and descriptions out there including the ones that I just listed are effectively describing storm troopers who simply do what they are told, which is nonsense. I would like to take this opportunity to describe directly, based on my experience of 20+ years managing and directing government, aerospace, IT, financial, and legal projects, leading GPM, and serving as President for the U.S.’s member association of the International Project Management Association (IPMA-USA). Before I provide what I believe to be a sound description, I want to state that I more or less agree with GAPPS when they state that the challenges in defining the Project Manager role in a way that would be applicable across a wide range of organizations, application areas, and project types are that Project Managers are expected to produce essentially the same results – outputs and outcomes that are acceptable to relevant stakeholders. That does not mean that these challenges make it impossible to give a concrete role definition. I believe that all of these factors should emphasize the importance of a simple and sensible description. Use the Force or follow orders? I believe that it is time for project managers to become less like Stormtroopers and more like Jedi. Why? By comparison, a Jedi’s five traits are Reliability, Objectivity, Humility, Patience, Wisdom, all of which are needed to achieve positive results. 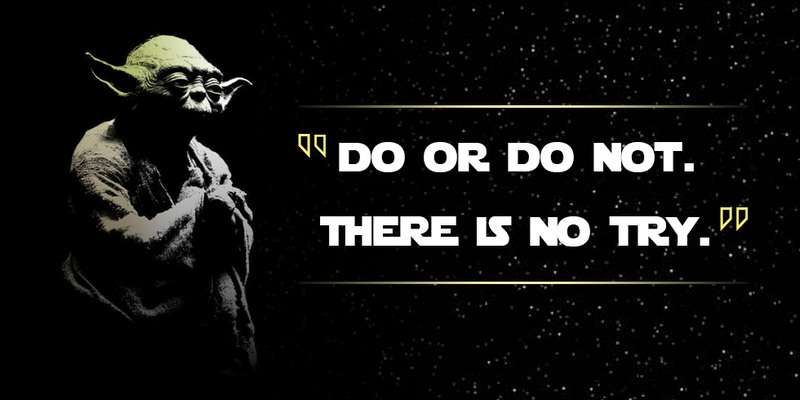 Take the classic line from The Empire Strikes Back where Yoda is instructing Luke and says “Do. Or do not. There is no try.” This simply means to commit oneself to something completely, win or lose. This is the kind of project manager that I would hire. Compare with the scene in The Force Awakens where Captain Phasma addresses Finn when he returned from his first battle, having not fired his blaster. Captain Phasma: FN-2187, submit your blaster for inspection. Captain Phasma: And who gave you permission to remove that helmet? A Stormtrooper’s traits are only “don’t stick out” and “shoot when told.” This is an output focused approach that requires little more than the ability to manage tasks. This is not the kind of project manager that I would hire. So, without further ado, here is my short and sweet 16 word definition. Was that so hard? No. My rationale for wording it the way I did is based on the fact that the business case provides the vital test of the viability of the project. It is used to gain funding and should be actively maintained throughout the life of the project and be continually updated with current information on costs, risks and benefits, and impacts. If the goal of a project is to realize the business case, then it goes without saying that the role of a project manager is to ensure those benefits can be realized and rely on their skills, ability, and knowledge to do so. So ask yourself, are you a Stormtrooper or a Jedi? Related: For a deeper perspective on output vs benefits focus, see Peter Milsom’s excellent post. To get the Jedi’s PM weapon, download our P5 Standard for Sustainability in Project Management. It’s free! Good article, Dr. Joel but I would challenge you on a couple of points. First is your statement that “pilots” make “STRATEGIC” decisions. As a pilot, I can state factually that is not true. aS A Pilot in Command (PiC) we get to make TACTICAL decisions, which is CONSISTENT with being a project manager in OWNER organizations. For more on the differences between STRATEGIC and TACTICAL in the context of applied project management, go HERE https://en.wikiversity.org/w/index.php?title=Introduction_to_Strategic_Studies/What_Is_Strategy%3F_Why_Study_Strategy%3F&_Why_Study_Strategy%3F= Linking this to your analogy, means the “project manager” is in fact a Company Grade Officer- Lieutenant, Captain or perhaps a Major. Certainly not Colonel or General level. The other concern I have lies with the fact that you have chosen how organizations representing the practice of project management define who we are and what we do. Surely you can agree that there is a high probability that these organizations are taking a biased or favorable view ? If you go HERE http://www.planningplanet.com/guild/gpccar/introduction-to-managing-project-controls and scroll down to Figure 2, you will see a graphic originating from R. Max Wideman back in the mid-1970’s which illustrates that in an OWNER organization, project managers are not high level managers at all, but merely low level managers, with no formal power or authority to make strategic decisions and in many cases, limited in their formal authority to even make tactical decisions. Which means that whether we like it or not, most project managers working in OWNER organizations, are more closely aligned with the “Stormtrooper” model, where they are following orders. Thus UNLESS we, as project managers have been formally empowered to make strategic decisions, there is no way that we can or should be held accountable for the BUSINESS CASE. The reality being that we have enough of a challenge just managing the tactical challenges facing us. Bringing this back to our airline pilot analogy, does the pilot have ANY control over how many people choose to fly on his/her flight? Does the PiC have any control over which plane he/she gets to fly that day? Does the PiC have any control over choosing the crew he/she has been assigned for that flight? Bottom line- I would hope you at least qualify your definition as being a worthy “to be” situation but having been in the project management business for more than 40 years now, I have yet to see it happen and seriously doubt I ever will. Regarding Pilots, I was not implying that at all. What I was implying is that the statement “understanding and applying the knowledge, tools, and techniques that are recognized as good practice are not sufficient for effective project management.” as a caveat under a role description is silly. I can tell you with 100% confidence that project managers are being empowered to make more strategic decisions. At present, our GPM Centre of Excellence is providing advisory for four projects that have a budget around 500 Million USD and in each instance, the project managers are being given larger strategic roles, a trend that I see increasing. As I stated in my post, that in my experience across multiple industries, having worked for the big four consulting, a top 5 U.S. National Bank , Aerospace, and local government, I have always been in a role as project manager to make strategic decisions. Many of my colleagues, share the same experience. I will not say that my experience negates yours of vice versa however I will state that from my position, in today’s business landscape, there is a trend in this direction. We are developing a survey that will span 100 countries and over 25,000 project managers and executives which we expect to validate this. We will happily share the findings. Hello admin how are you doing? I read your post about Hey Project Manager, are you a more of a Jedi or a Stormtrooper?. I really like your post and also the other posts you have on your blog. You’re sharing a really good information for project managers. Pingback: Sustainable Development Goal #13 of 17 and Project Management, Climate Action.